William Patten (1820-1907) and his brothers, John Jehu Patten, Jethro Patten, James Patten and Matthew Elihu Patten all lived within the vicinity of Rays Mill, GA (now Ray City) and Milltown, GA (now Lakeland). They were sons of Elizabeth and James M. Patten. Their mother, Elizabeth Lee Patten, was a daughter of Joshua Lee, who about 1830 dammed the northern outflow of Grand Bay, and constructed a grist mill at Allapaha, GA (now Lakeland), GA. Their sister, Nancy Patten, married John F. Clements in Lowndes County in 1840. William, the oldest of the Patten brothers, married Elizabeth Register on May 4, 1845. She was a daughter of Samuel Register, of Registerville, GA (now Stockton, GA), born in Lowndes, now Lanier County, August 31, 1828. The couple made their home near Ten Mile Creek in the area later known as Watson Grade where they raised 12 children. William Patten was Justice of Peace in the 664th district, Lowndes County, 1845-1848, and 1849-1856. It is widely reported that William’s father, James M. Patten, died in 1846. His grave marker bears that date, but legal notices published in the period newspapers clearly indicate he died prior to March 4, 1845. On that date William Patten applied for letters of administration on the estate. These are therefore to cite and admonish all and singular, the kindred and creditors of said deceased, to be and appear at my office within the time prescribed by law, to shew cause, if any exists, why said letters should not be granted. Given under my hand at office, this 4th day of March 1845. William Patten was appointed the administrator of his father’s estate. Since the legal rights of women were severely abridged in those days, William Patten also acted as legal guardian for his minor siblings, Sarah Patten, James Patten, Elizabeth Patten, John Jehu Patten, Mathew Elihu Patten and Mary Patten. William drew Lot number 5, consisting of “29 head cattle marked crop & split in one eare and under l— in the other, branded VV, approved to $4 per head” and took possession of similar lots on behalf of his six wards. William also purchased from his father’s estate a crosscut saw at $7.00, one bed & furniture at $11.00, one grub hoe at $.50, one desk, powder canister & trunk at $2.75, and five bee hives at $5.37. William Patten was baptized into Union Primitive Baptist Church on September 9, 1848. The church was constituted in 1825 on the banks of the Alapaha River by his parents, Elizabeth and James Patten, and maternal grandparents, Martha and Joshua Lee, along with William A. Knight, Sarah Knight, Jonathan Knight, Elizabeth Knight, Mary Knight, Josiah Sirmans, and Matthew Albritton. William Patten served as clerk of Union church from May 10, 1851 to 1854 when he was dismissed by letter March 11, 1854, to unite with Jethro Patten, Aden Boyd, Nancy Boyd and others in organizing Empire Church. The Boyds gave the land for the church, located near Five Mile Creek about six miles northeast of present day Ray City out the Sam I. Watson Highway, on Empire Road. Jethro Patten served as first deacon to the church. William Patten remained a member of Empire church until his death. William and Jethro were ordained to the ministry by Empire Church and served as pastors to several churches in Clinch and Berrien Counties. In 1856, William Patten’s place was cut out of Lowndes into Berrien County and he was immediately elected to the office of Justice of the Peace in the newly formed 1144th district, an office he held from 1856 to 1869. In 1862 he was Captain of the militia district. There is nothing in the 1850 Census of Enslaved Inhabitants of Lowndes County or 1860 Census of Enslaved Inhabitants Berrien County to indicate that the Pattens were slave owners. But like many other southern white men, both slave owners and non-slaveholders, the Pattens went off to fight for the Confederate States of America during the Civil War. Historian Gordon Rhea attributes non-slaveholders’ commitment in the Southern cause to deep held belief in white supremacy, increasing isolation and alienation from the North, and the southern theological interpretation of biblical support for slavery. Near universal messaging from Southern religious, political and community leaders reinforced the fears in white southerners of slave rebellion, collapse of the southern economy, loss of status and privilege, and the alleged criminal desires of freedmen. It is said that William Patten, John Jehu Patten, James Patten, Matthew Elihu Patten and Jethro Patten all fought for the Confederacy. It appears that Jethro Patten served in the 12th Georgia Militia. Jehu and James served with Company E, 54th Georgia Regiment. William served with Company I, 54th Georgia Regiment. Other Berrien Countians in Company I included John Gaskins, Fisher Gaskins, William Gaskins, Joseph Gaskins, and Lemuel Elam Gaskins. Matthew E. Patten’s Civil War service is not known. Lewis C. Patten born October 11, 1847; never married; died September 18, 1890. William C “Babe” Patten born December 28, 1849; married (1) Sarah Lee (2) Laura Watson. George W. L. Patten born April 21, 1852; died August 8, 1864. Henry R. Patten born April 17, 1854; died single, November 23, 1873. Catherine Matilda Patten born December 20, 1864; died single July 2, 1893. Mary Jane “Mollie” Patten born November 30, 1866; married John Thomas “J.T.” Webb (1863-1924); died 1955. Edward Levi Patten born March 31, 1869; died single July 7, 1928. In 1865 William Patten joined the Masonic fraternity, receiving his degrees in the old Butler Lodge No. 211 at Milltown, GA (now Lakeland). Other members of Butler Lodge included Thomas M. Ray , Hardeman Sirmans and Jesse Carroll. William Patten was demitted September 18, 1880, and on account of the attitude of his church towards Masonry, never affiliated with a lodge thereafter. In 1867 William Patten owned all 490 acres of Lot 385 in the 1144th Georgia Militia District of Berrien County. 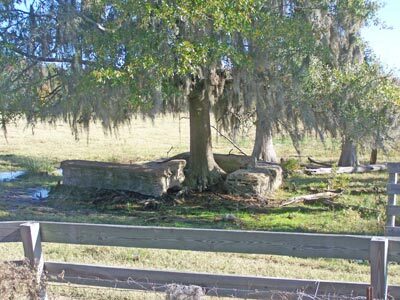 Lot 385 was north of Milltown (now Lakeland) between the forks of the Alapaha River and Ten Mile Creek. To the west, on Lot 384 his brother James Patten also had some property and the rest of that lot was owned by J. C. Clements. Lot 353 to the northwest was but a small part of the holdings of M. C. Lee. By 1874, William Patten acquired an additional 490 acres on the adjacent Lot 351 which straddled the Alapaha River. In 1880, William Patten’s place consisted of 60 acres of tilled land and 920 acres of woodland. He put in 17 acres of corn producing 60 bushels, 20 acres of oats producing 300 bushels, 20 acres of cotton producing 8 bales, 1 acre of cane producing 300 gallons of molasses. He produced well over 100 bushels of sweet potatoes. His orchards included over 100 apple trees and 100 peach trees. His real estate was valued at $800. He owned $50 worth of farming implements and machinery, and $450 in livestock. For the year 1879, he spent $20 on building and repairs, $70 on fertilizer, and $30 on labor. He had one ox, 28 milk cows, and 37 head of other livestock. His herd dropped 16 calves that year and he slaughtered only one animal. On June 1, 1880 he had 75 sheep. His flock dropped 35 lambs that year and he slaughtered three animals. Five sheep were killed by dogs, and ten animals died of stress of weather. He sheared 50 fleeces for 120 pounds of wool. He had 17 hogs, about 20 barnyard chickens and about 50 other poultry. The estimated value of all farm production was $530. When the 1300th Georgia Militia District was formed in 1889, William Patten was elected Justice of the Peace in that district serving in the office until 1893. Fall in South Georgia from October through the end of the year is still syrup making time -the time that sugar cane is cut and cane syrup produced. In the 1890s, one of the biggest producers of cane syrup and cane sugar in Berrien County was William C. Patten. His production was noted for the use of the Chattanooga Evaporator, which allowed for continuous processing of the juice into syrup, rather than the “batch processing” done in the broad iron kettle of the home farmer. Almost hidden in the steam, the cooker stands over a Chattanooga evaporator and dips his ladle here and there to skim the scum. Occasionally he tests the boiling syrup as it drips from the skimmer and when it “acts right” he lets it out. He doesn’t need a saccharometer, and instrument commonly used for the purpose, to know when the syrup is done. His eye is keen and his judgement ripe and he knows when the sweetsome flood is ready. This interesting process is taking place in South Georgia where the natives insist upon sugar-cane syrup and cannot see the taste of a Tennessean, for instance, who has to have his sorghum, which is thicker but not any sweeter. All the same, either goes with flapjacks and hot biscuits – and what would the kids do without old-fashioned molasses candy? There is a Chattanooga cane mill nearby that crushes the stalks as they come from the field and presses out the juice, which then is piped to the evaporator where the cooker keeps a wary eye on the sugar content while the fire is taking out the water. It is said that sugar cane cultivation was first introduced into south Georgia by John Moore when he moved to Lowndes County around 1828. By 1876, Sugar cane became one of the staple crops of Wiregrass Georgia, Berrien County, and of Ray City. Every farmer had a small cane mill on his farm for pressing the cane to extract the juice, which was cooked down in a cast iron kettle to make syrup. Hundreds of gallons of cane syrup could be produced from a single acre of sugar cane. Local syrup producers over the years have included the likes of Jehu Patten (1838-1907), farmer of the Rays Mill (now Ray City) District, who in 1896 had “300 gallons of syrup jugged and sealed,” as well as his home produced cane sugar; Levi J. Clements (1851-1924, patriarch of the Clements family and founder of the Clements Lumber Company at Ray City; David C. Clements (1857-1902) who shipped his Georgia cane syrup from Ray City to markets as far as Texas; Moses C. Lee (1853-1926), exemplary farmer of Ray City, who in a year “jugged and barreled 750 gallons of syrup, of the finest that can be made”; Della Outlaw (1891-1932) made cane syrup on what is today the W. H. Outlaw Centennial Farm near Ray City, and bottled it for sale in Nashville, GA (Today, her grandson, Bill Outlaw, makes cane syrup in the family tradition); David Jackson Skinner (1898-1962), a farmer of the Ray City, GA area and a Deacon of New Ramah Church put up his syrup in cans; Wiley Chambless (1832-1888) was a Berrien county farmer who grew “red” and “red ribbon” cane; J. McMillan, J.J. McMillan and J.L. Harper, of Alapaha together produced 25 barrels of cane syrup for shipment in 1885; J.N. Bray, of Berrien County, in 1908 produced 2000 gallons of cane syrup; George W. Leggett (1846-1922) shared the use of his syrup making equipment with family and friends. William C. Patten was a son of William Patten and Elizabeth “Betsey” Register. He married Sarah Lee, who was the daughter of Moses Corby Lee and Jincy Register. A prominent farmer of Berrien County, GA, William C. Patten was a Notary Public and Ex Officio Justice of the Peace. When his wife’s niece, Jennie Lee, married Samuel I Watson in 1900, it was W. C. Patten who performed the ceremony. W.C. Patten, after the death of his first wife, married Sam Watson’s sister, Laura Watson. The evaporator is generally placed down hill from the cane mill so that gravity can be used to get the juice from the mill to the evaporator. The evaporator is a shallow pan about three and one-half feet wide by from five to fifteen feet long. Chattanooga evaporators have partitions about nine inches apart, with a small opening or gate at alternate ends to make the juice flow back and forth across the evaporator. The evaporator rests on a furnace made of steel or brick. Pine wood is considered the best fuel, as it makes a quick, flashing fire and gives more uniform heat the full length of the pan. The aim is to keep a constant flow of juice into, and from, the evaporator. About thirty minutes after the juice enters the evaporator it leaves it as a clear, delicious syrup. The picture [above] shows a real South Georgia syrup maker. The quality of the syrup depends a great deal on the skill of the “cooker.” As the juice begins to boil a thick, slimy, green scum rises, bringing with it all the impurities. This is skimmed off and thrown into a barrel. Just a word about that barrel. Sometimes it becomes the focal point of a great deal of attention, such as might arouse the curiosity of the uninitiated. After the skimmings have stood a while a certain amount of juice settles at the bottom, and that juice develops a kick that would bring happiness to prohibition sufferers could they get a chance at it. 1920 advertisement for Chattanooga cane mills, evaporators, furnaces and accessories. Sarah Malinda Clements was born March 12, 1862 in Berrien County, GA. She was the youngest of 13 children born to David G. Clements and Gincey Sirmans. 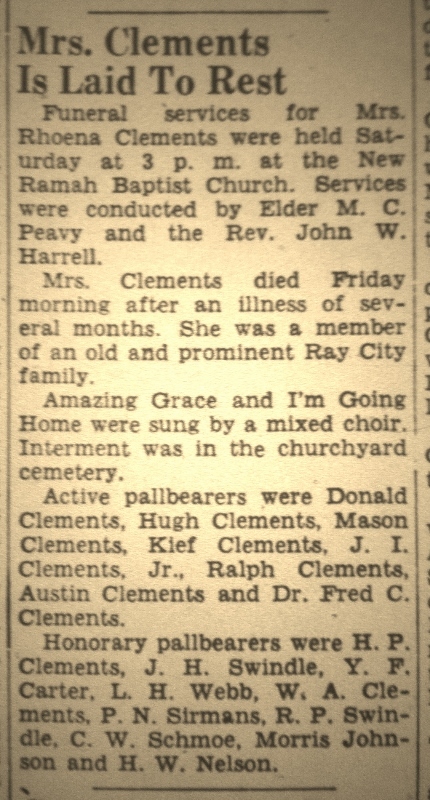 She was a sister of Levi Jordan Clements, who was the patriarch of the Clements sawmill business at Ray City. Sarah’s parents were pioneer settlers of the area. They were married in Lowndes County, GA on January 1, 1835. Her father came with his parents to Lowndes County about 1832. Her grandfather William Clements and William A. Knight had been neighbors in Wayne County, GA, and her aunt Anne Donald Clements had married Levi J. Knight in 1827. Her mother was Gincey Sirmans, a daughter of Abner Sirmans and Bettie Kirkland. Abner Sirmans, his brothers, and father, Josiah Sirmans, were among the first permanent settlers of Clinch County, GA, having arrived there in 1822. Her aunt Elizabeth “Betsy” Sirmans married Etheldred Dryden Newbern, another pioneer settler of Berrien County. Sarah’s father and both of her grandfathers, fought under the command of their friend and neighbor Levi J. Knight in the Indian Wars of 1836-1838. David G. Clements, William Clements and Abner Sirmans all served with Captain Knight’s Independent Company. David Clements was among those who took part in the Battle of Brushy Creek, one of the last real engagements with the Creek Indians in this region. Soon after marriage, David G. Clements acquired lot of land 406, 10th district, on which he lived and farmed until his death. 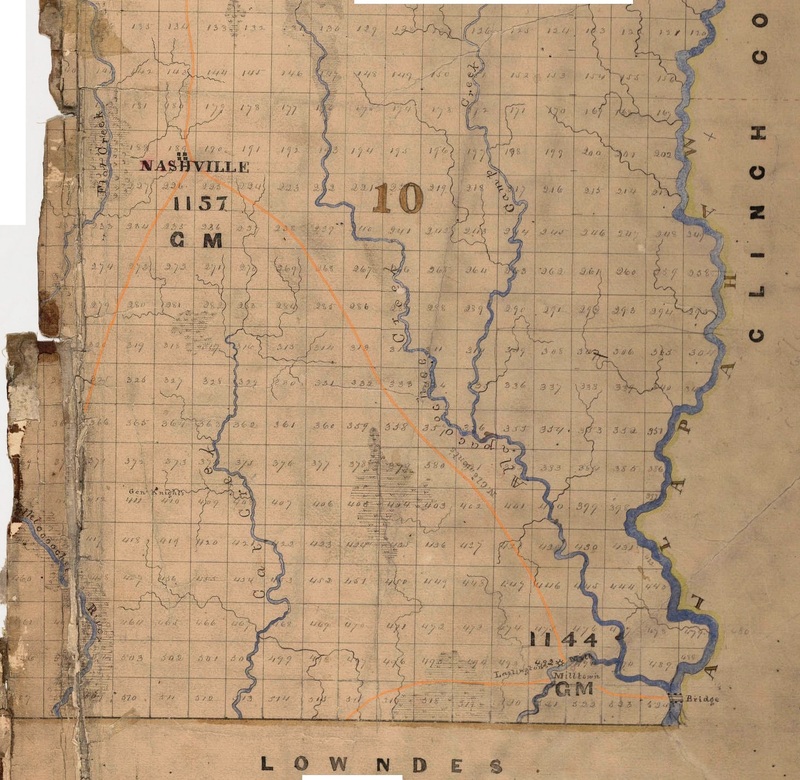 He was cut into Berrien out of Lowndes County, 1856. In Berrien County, the Clements home place was in the 1144th Georgia Militia District just north of Ray’s Mill (now Ray City), GA. In 1854, Sarah’s sister, Elizabeth Clements, married William Gaskins. The Clements were neighbors of William Gaskins, son of Fisher Gaskins. The Gaskins were another of the early pioneer families of Berrien County. William Gaskins came to the area with his father and brothers, John Gaskins and Harmon Gaskins, with their large herds of cattle, about the same time the Knights and Clements were homesteading in the area around Beaverdam Creek (site of present day Ray City, GA). At the outset of the Civil War, Sarah’s father and brother, John C. Clements, answered the call of General Levi J. Knight to form a company of men for Confederate service; their names appear on an 1861 muster roll of the Berrien Minute Men. John C. Clements served with Company K, 29th Georgia Regiment; David G. Clements later appears on the 1864 census of southern men who were excluded from the draft on account of age. Sarah, born during the Civil War, grew up on her father’s farm during the Reconstruction period in Georgia. She attended the local country schools and was educated through the 5th grade. It appears that she lived in her father’s home until his death in 1888. Although Sarah married twice, she was not lucky in love. She did not marry until the age of 36. In the Census of 1880, 18-year-old Sarah Ann Clements was enumerated by Census taker Lacy Elias Lastinger in her father’s household. Also present was Sarah’s older sister Mary Ann, to whom she was devoted for life, and their siblings. Next door were Sarah’s sister, Elizabeth “Lizzie” Clements, and her husband William Gaskins. Also neighbors were William’s niece Mary Evelyn Gaskins and her husband George W. Fender. On October 26, 1898 Sarah married William J. “Bill Jack” Knight. He was born in 1860, but otherwise little is known of his history. 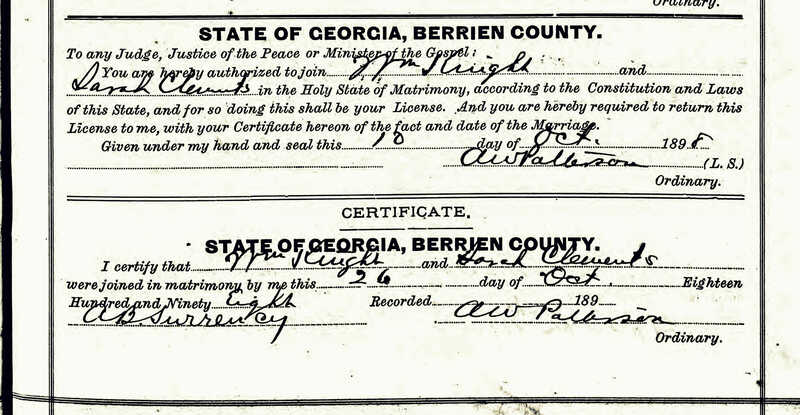 The ceremony was performed by Albert Benjamin Surrency in Berrien County, GA.
Sarah Clements and William J. Knight are enumerated together in the census of 1900 in their Rays Mill home. Sarah’s spinster sister, 59-year-old Mary Ann Clements, had also come to live in the Knight household. Sarah’s brother, John C. Clements, and his family remained as neighbors, as did George W. Fender. William and Sarah owned their farm near Ray’s Mill free and clear of mortgage. Only one offspring was born of this union, but the child died young. 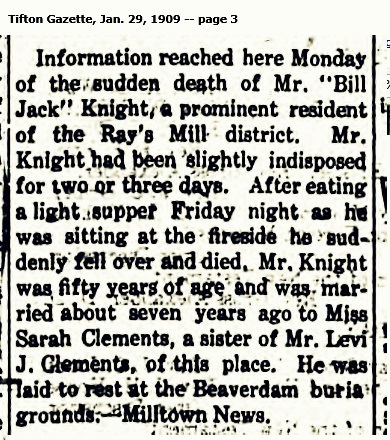 William J. Knight died on January 22, 1909 at his home near Ray’s Mill, GA.
Information reached here Monday of the sudden death of Mr. “Bill Jack” Knight, a prominent resident of the Ray’s Mill district. Mr. Knight had been slightly indisposed for two or three days. After eating a light supper Friday night as he was sitting at the fireside he suddenly fell over and died. Mr. Knight was fifty years of age and was married about seven years ago to Miss Sarah Clements, of this place. He was laid to rest at the Beaverdam burial grounds. – Milltown News. The widow Sarah Knight was enumerated (as Sarah Clements) in 1910 with her sister Mary Ann Clements in their home just east of Ray’s Mill. They were neighbors of John B. Fountain and Frank Gallagher. Some time before 1920 Sarah married for a second time, joining in matrimony with James W. Suggs. He was from Dooly County, GA, a son of Malinda “Lynne” Proctor and Wright Suggs. Sarah and James W. Suggs were enumerated together in the Census of 1920, at their farm on a settlement road near Ray’s Mill. Sarah’s sister and constant companion, Mary Ann Clements, resided with the Suggs. On adjacent farms were Parnell Knight and Henry D. Bennett. The 1926 Influenza epidemic reached its peach in Georgia in March; 1926 was the worst flu year since the pandemics of 1918-1919 which had claimed 675,000 lives in the U.S. and more than 30 million worldwide. Sarah’s sister, Mary Ann Clements, at the age of 86, succumbed to Influenza, dying on March 26, 1926. 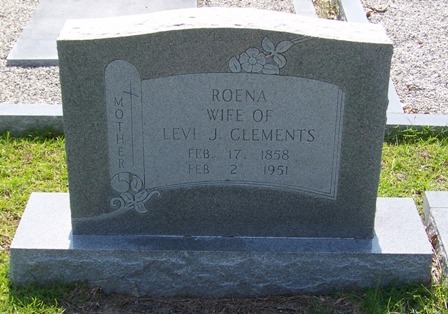 She was attended by her nephew, Dr. Henry W. Clements, who was a son of Rowena Patten and Levi J. Clements. She was buried at Empire Church Cemetery. 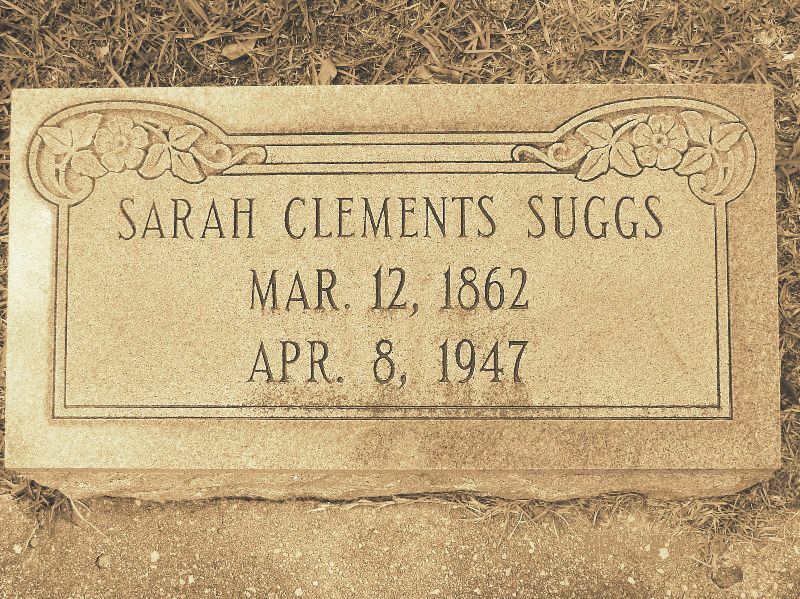 Sometime between 1920 and 1930 James W. Suggs died, leaving Sarah widowed for the second time. Sarah, now on her own, boarded in the farm home of Sherrod Winfield Fender and his wife, Lula Bell Smith. Sherrod was a son of George W. Fender, and a neighbor of Henry Studstill, Arrin H. Guthrie, and Phil McGowan. Also lodging in the Fender household was Chester Nobles. Sherrod W. Fender died in 1931, but Sarah continued to live with the widowed Lula Smith Fender. 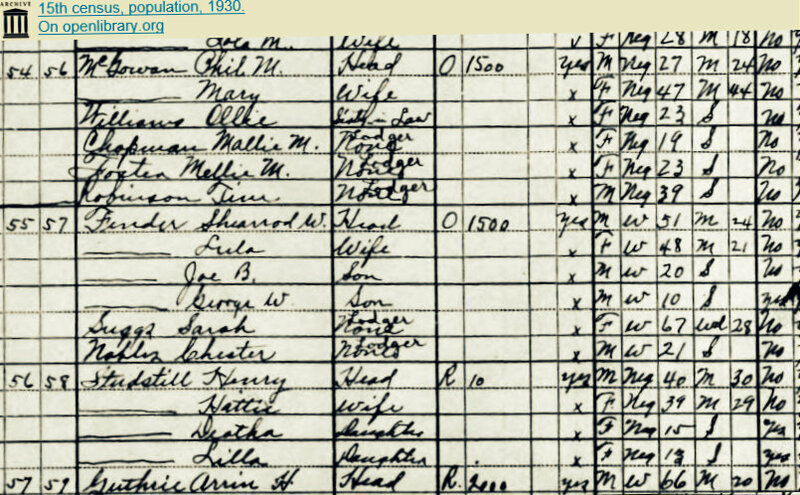 The 1940 census shows Sarah Suggs enumerated as a “companion” of Lula Fender. 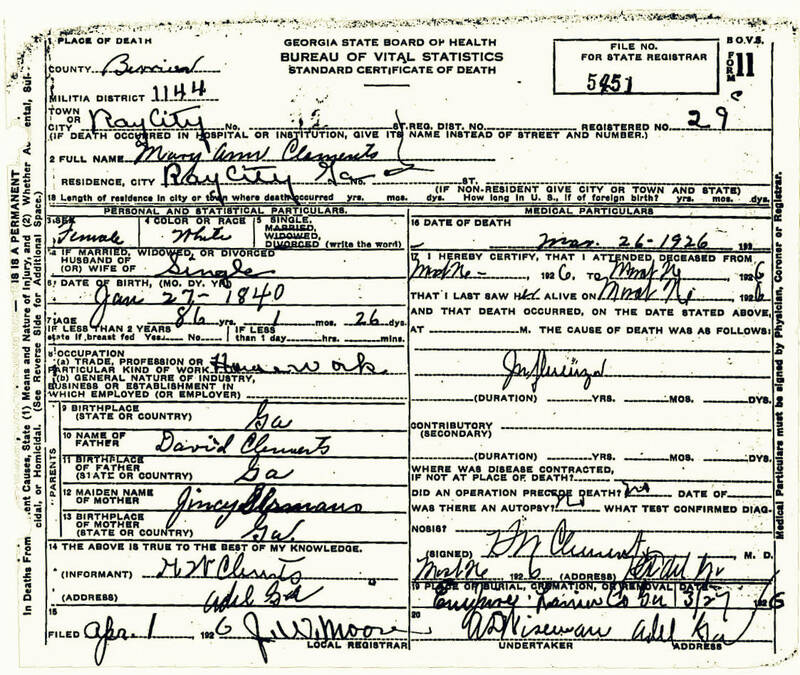 1940 census enumeration of Sarah Clements Suggs in the Ray City, GA household of Lula Fender. Mr. Joe Donald (Don) Clements, age 83, of Rome, GA, passed away on September 26, 2014, at his home following an extended illness. Mr. Clements was born in Ray City, Berrien County, Georgia, on February 26, 1931. He was a son of the late Joseph Samuel Clements and Effie Oquinn , and a grandson of Levi J. Clements and Elizabeth Roena Patten. 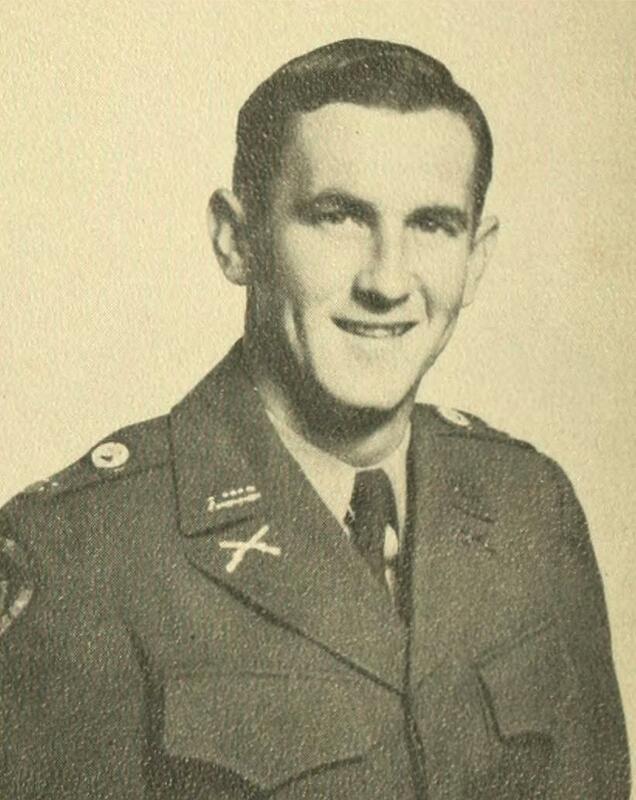 Mr. Clements attended college at North Georgia College where he served in the Corps of Cadets. He excelled in athletics playing on the varsity baseball team, and was known as the Ray City Flash. Following graduation, he served in the United States Army, leaving the service as a First Lieutenant in 1956. Mr. Clements was an insurance manager with Crawford & Company for 37 years. After his retirement from Crawford & Company, he worked another 15 years for the Mundy & Gammage Law Firm as a consultant on insurance matters. He was a long time member of the First Baptist Church of Rome and served his church in many capacities. He was a faithful volunteer at the Rome Food Pantry, the William S. Davies Homeless Shelter, and the Community Kitchen. Survivors include: his wife of more than sixty years, Helen Gudger Clements; three sons, Joe Donald Clements, Jr. (Cecilia) of Springfield, VA; John Terry Clements (Rebecca) of Atlanta, GA; James Frank Clements (Alice) of Rome, GA; and one daughter, Susan Clements Thornhill (Simon) of Santa Cruz, CA. Survivors also include seven grandchildren and one great-grandchild. A memorial service was held on Sunday afternoon September 28, 2014 at 2:00 p. m. in the sanctuary of the First Baptist Church of Rome with Dr. Joel Snider officiating. Visitation immediately followed the service. In addition to serving as Ray City’s first doctor and first Mayor, Charles X. Jones was among the town’s early bankers. 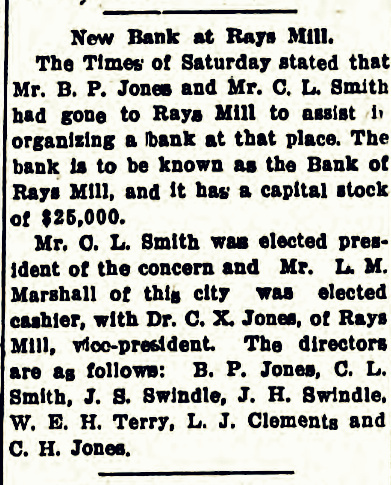 The Tuesday, May 23, 1911 Valdosta Times noted that Dr. Jones was elected Vice President of the Bank of Rays Mill, GA. Clarence L. Smith was the President, and Lewis M. Marshall, cashier. New Bank at Rays Mill. The Times of Saturday [May 20] stated that Mr. B. P. Jones and Mr. C. L. Smith had gone to Rays Mill to assist in organizing a bank at that place. The bank is to be known as the Bank of Rays Mill, and it has a capital stock of $25,000. Mr. C. L. Smith was elected president of the concern and Mr. L. M. Marshall of this city [Valdosta] was elected cashier, with Dr. C. X. Jones, of Rays Mill, vice-president. The directors are as follows: B. P. Jones, C. L. Smith, J. S. Swindle, J. H. Swindle, W. E. H. Terry, L. J. Clements and C. H. Jones. Later, Charles X. Jones served on the board of directors of Southern Bank & Trust Co., Valdosta, GA. In the early days of Ray City, GA, the economic engine of the community was sustained by farming and agriculture. Large stands of original growth yellow pine supported the development of turpentine and lumber industries in the area. Lumber and naval stores came to be among the most important historic businesses of Ray City. The opening of the Georgia & Florida Railway in 1908 spurred the growth of a sawmill that quickly became the major employer of the town. The sawmill was the first large mechanized industrial operation in the Ray City area. 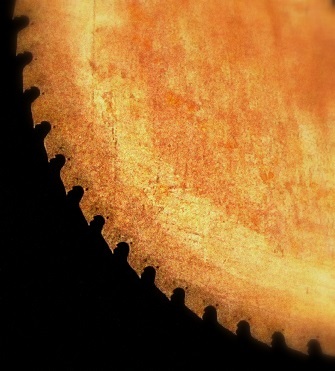 FIRST-CLASS circular saw filer wants a position; can give any reference concerning smooth lumber. No booze fighter. In the traditional agricultural occupations issues like child labor or safety were personal matters. But as employment grew in the emerging industrial workplace the risks and concerns of the community also grew. In 1923, the Nashville Herald reported an industrial accident at the Clements sawmill. In early February of that year a young boy, son of Math Phillips, had his eye put out at the sawmill, leaving some to wonder if it was time for stricter enforcement of compulsory school attendance. Sawmills were dangerous workplaces and newspaper reports of more horrific accidents were not entirely uncommon. With the stockpiling of combustible materials, there was a constant ever present danger of fire – a threat that was magnified in steam-powered sawmills where boilers were typically fired with scrap material. Over the years this sawmill was operated under three different owners. The big sawmill at Ray City first operated under the name Luckie Lumber Company, owned by William F. Luckie. It was a huge operation located about one mile north of Ray City on the rail line of Georgia & Florida Railway . About 1911, W. F. Luckie sold out to Levi J. Clements and his sons. The Clements Family had experience in the sawmill trade, and the Clements boys were college-educated businessmen. The Clements Brothers ran the company, Lucius J. Clements served as General Manager of the Clements Lumber Company, Irwin Clements was a manager at the mill, and Joe Clements was treasurer. The superintendent of the mill was Melvin W. Rivenbark. Clarence Jones Gray was stenographer and bookkeeper for the firm. James Edmond Hall and John William Sims were Shipping Clerks and Chester Artemis Hall was an Assistant Shipping Clerk. George B. Norton was foreman of the planing mill. William Andrew Hendrix was an engineer and Samuel Arthur Ganas was employed at the mill as a stationary engineer. Morris C. Sumner was the assistant lumber inspector and Timothy Allen Washington was a lumber grader. Willis Gordon Hill was a stave miller. William Haines Joiner was a locomotive engineer and J. D. Melvin was a fireman. Jacob Ed Akridge was woods superintendent. Tom Lott and Elmore Medley were teamsters and Bee Mannin was a log chopper. Robert Christopher Powell was a skidder operator and Ples Phillips worked on the tram road. Will Thomas was a sawyer. R.D. Ward was a machinist. Bashey Wells was a contractor. Freddie Andrew Wheless was a carpenter. Many men and sometimes boys were employed as “sawmill laborers”, others worked as sawyers, teamsters, firemen, foremen, wheelwrights, commissary clerks, or marketmen. Many of the women worked out of their homes, in the occupation of “laundress.” By 1920, the sawmill had grown to a large industrial operation. A ‘sawmill town’ had grown up to house the sawmill workers and their families. The enumerator for 1920 US Census annotated the census forms to indicate the sawmill residents, showing that there were 78 households with 313 residents living in rented homes at the sawmill. More workers lived in the surrounding area and in Ray City. While residents of the ‘sawmill town’ had access to all of the goods and services in Ray City just a mile south on the tracks of the Georgia and Florida, the sawmill company also operated a commissary where workers could shop. In the 1920’s the Clements sawmill provided a cold storage facility for curing meats as a part of the company operations. The cold storage was also available to the people of Ray City and the surrounding area. The few cold days we had last week were fine for people to hang up their meat. The Clements Lumber Company cold storage cured about 76,000 pounds, all of which was removed last week. Before the widespread availability of electricity and electric refrigerators, cold storage of meat was an important service to the community. Poisoning could result from consumption of meat which was improperly cured or stored. 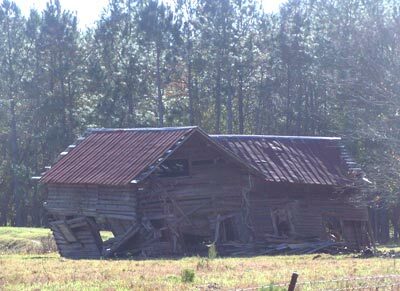 Photographed in 2008, this log house was moved to the old Clements sawmill area around 1975-78 by John David Luke. The original structure was built with notched logs, the wing extending to the right, rear was constructed with sawn boards. By 1923, the Clements were operating ten miles of tram road track to bring timber to the sawmill. The operation also included a lathe mill, and a planer. The mill had a inventory of sawn lumber on the ground with an estimated value of about $30,000. In 2013 dollar’s that would have been more than half a million dollars worth of lumber. If the Spring of 1923 brought the town’s biggest economic boom, the fall of ’23 brought its biggest bust. For on November 6, 1923 fire struck the big sawmill at Ray City, GA devastating the operation and the local economy. Clements Sawmill Site in 2008, Ray City, GA. 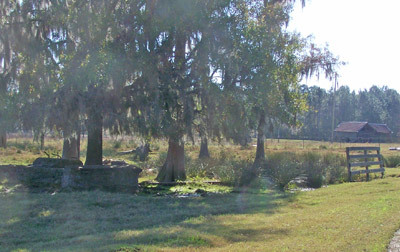 This view of the site of the Clements Sawmill, taken from the tracks of the Georgia & Florida Railroad, shows the location of the remaining foundations. In the distance a residential structure that was later moved to the sawmill site. The “company town” which grew up around the sawmill once boasted a population of more than 300 people and 78 households. Clements Sawmill Foundations, 2008, Ray City, GA.
Eighty-five years later, all that remains of the Clements Sawmill are a few concrete foundations in a cow pasture located about one mile north of Ray City, GA, on the tracks of the Georgia and Florida Railway. Protruding from these foundations are heavy steel anchoring bolts, perhaps used to secure cutting or planing equipment, or to support boilers used to generate steam power for the mill. The enumerator for 1920 US Census annotated six pages of the census sheets indicate the sawmill residents, showing that there were 78 households with 313 residents living in rented homes at the sawmill. While many soldiers were taken by the sea in the sinking of HMS Otranto, at least three Berrien county men survived the disaster. Among the survivors, James Marvin DeLoach. DeLoach was never quite a resident of Ray City, GA but had connections with the town. In 1910, J. M. DeLoach purchased a lot on Jones Street in the newly platted city, but owned the property only a few weeks before selling out to Levi J. Clements. William Lindsey DeLoach, son of Mr. and Mrs. E. T. DeLoach, who live near Cycloneta, returned home Saturday from overseas service. He was with the Second Division, in the infantry, and took part in the big parade in New York. He received his honorable discharge at Camp Gordon Saturday. He went across in the summer of 1918. Mr. DeLoach had two sons, two nephews and a brother [J.M. DeLoach] in foreign service, all escaping without a scratch except his brother who was injured when he jumped from the sinking Otranto. Mr. DeLoach will give a homecoming picnic to the boys and their friends at his home Saturday. James M. DeLoach, at age 27, registered for the draft in the 1144th Georgia Militia District, the Ray’s Mill District, on June 15, 1917. Following President Woodrow Wilson’s declaration of war on Germany, the Selective Service Act had been passed authorizing the registration and drafting of men into the U.S. armed forces. The first registration began on June 5, 1917, and included all men between the ages of 21 and 31. Thomasville Times Enterprise headlines declaration of war, April 6, 1917. Military records show that Deloach was fair-haired with blue eyes, tall at six feet – one inches, with a medium build, and single. His draft card was processed by Charles Oscar Terry, who served as Registrar in addition to his regular pursuits as druggist and merchant of Ray City, GA.
At the time of registration, Deloach was working a farm at Milltown, GA (now Lakeland) under the employment of Ray City businessman Hod. P. Clements. James M. DeLoach continued to work for another year as the war dragged on, but the following summer he volunteered for service and enlisted as a private about July 16, 1918 at Nashville, GA. He was assigned to the Coast Artillery and trained at Fort Screven, GA.
After training DeLoach and hundreds of other Georgia men were sent to New York, where they boarded the troopship H.M.S. Otranto. The ship departed New York on September 24, 1918 on what was to be her final, tragic voyage. Among the contingent of Berrien County men sailing along with DeLoach on Otranto were Ralph Knight and Shellie Webb, of Ray City, GA; James Grady Wright of Adel, GA; and Early Steward of Nashville, GA.
On the 6.10.1918, the Auxiliary Cruiser Otranto, bound from New York to Glasgow, with a crew of 360 men and some 660 American Troops, collided with the P. & O. Liner Kashmir off the North Coast of Islay. Both ships had acted as Column Leaders in Convoy HX50 and arrived in the North Channel in the midst of a violent gale and poor visibility. When land was sighted, the Officer of the Watch aboard the Kashmir correctly identified it as Islay, but his counterpart in the Otranto mistook the ground for that of Inishtrahull. As a consequence, both ships were turned in toward each other and at 8.45 a.m. the Kashmir struck the Otranto with a fatal blow amidships on her port side. As the damaged vessels drifted apart, water poured into the huge hole in Otranto’s side and she drifted towards the rocky coast of Islay. First to answer the stricken vessel’s S.O.S. calls was the Torpedo Boat Destroyer H.M.S. Mounsey, commanded by Lieutenant F.W. Craven and crewed by such men as Stoker Petty Officer Shillabeer, shortly to be a D.S.M. The Mounsey reached the stricken Liner at around 10 a.m. and, dwarfed by her rearing and plunging 12,000 ton frame, very gallantly closed her to take off survivors. On no less than four occasions the plucky little Destroyer crashed against the Liner’s side, each time hundreds of American servicemen jumping from the latter’s decks in an effort to reach those of the Destroyer. In what must have been horrific circumstances, many of them met their death between the pitching sides of the two vessels, while many others sustained serious injuries on hitting the Mounsey’s deck. At length, however, with her decks perilously overladen, the Mounsey set sail for Belfast with an astonishing 596 survivors. Tragically at least another 400 souls remained trapped aboard the Otranto, and when she hit the bottom less than half a mile from shore, near Machir Bay, Captain Davidson gave the order to abandon ship – only 16 of these men ever reached land (Argyll Shipwrecks, P. Moir and I. Crawford refers). – Christie’s Auction House synopsis of the Otranto Disaster written for the auction of a Distinguished Service Medal and other service items that had been awarded to crewman Sidney William Shillabeer of the rescue ship HMS Mounsey. The medal lot sold for £897 ($1,492). Shellie Webb and Ralph Knight, along with some two dozen other Berrien men were among those who perished that stormy Sunday morning off the island of Islay. Captain Ernest George William Davidson, master of Otranto, also went down with his ship. Early Steward, of Nashville, GA was one of the very few who went into the sea and made it to the shore of Islay still alive. Lieutenant Francis Worthington Craven, commander of HMS Mounsey, made it to Belfast with his rescue-laden ship, and was later presented with the Distinguished Service Medal by President Woodrow Wilson and the Distinguished Service Order by the United Kingdom. Craven was killed in an Irish Republican Army ambush in 1921. 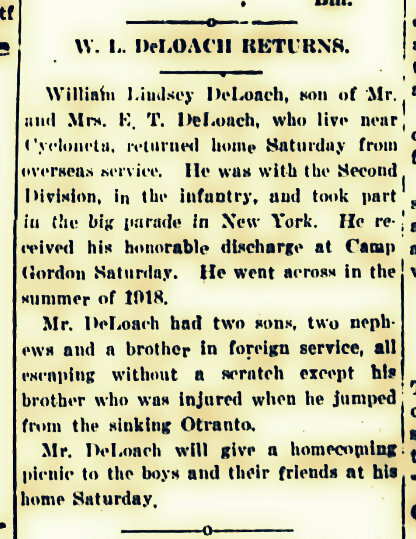 Private J. M. DeLoach, who went into service from Berrien County, but whose home is now in Lowndes, was up a few days ago to visit his brother, Mr. E. T. DeLoach near Tifton. Private DeLoach was on the Otranto when that ill-fated ship was rammed by the Kashmir and sank early on Sunday morning in October, 1918. He escaped, as did Sergeant? [James G.] Wright, by jumping to the deck of a destroyer below. He was knocked partially unconscious by the landing but he had enough presence of mind to catch another man’s leg to avoid being washed overboard. His –[text obscured]—- and he was unconscious –[text obscured]– before reaching port. –[text obscured]– he was sick and his temperature was 104 before he took the –[text obscured]–debated awhile because he was so ill.
DeLoach said the toughest part of the rescue was when the destroyer –[text obscured]– for the last time and the men –[text obscured]– were lined up at the –[text obscured]–it was not until then that they —danger. It was heartbreaking to see the men in the water begging to be taken on board, when nothing could be done for them. One man was washed off the destroyer by a big wave and then washed back on again. DeLoach was discharged from Army service on May 6, 1919 at Camp Gordon, GA. Afterwards, he made his way back to Hahira, GA , the place of his birth, where he returned to farming. James Marvin Deloach died May 10, 1976. 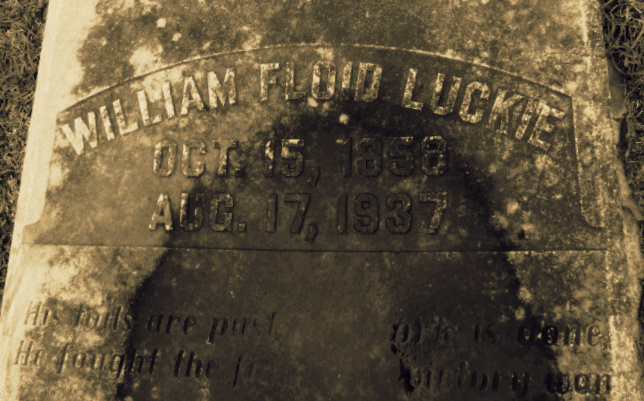 He was buried at Cat Creek Cemetery, Lowndes County, GA.
William Floyd Luckie, Jr. was born on October 15, 1858 in Greene County, Georgia. He was a son of William F. Luckie and Delaney Sayers, but was orphaned at an early age. His father was killed in 1859. In 1861, his mother followed in death. 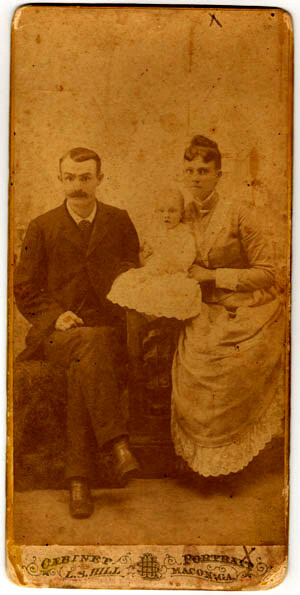 Afterward, William Floyd Luckie and his sisters, Falby and Mary were raised by their grandfather, James Martin Sayers, on his farm near Penfield, GA. William Floyd Luckie was enumerated there in 1870 as William Sayers. At the time, he was assisting his grandfather with farm labor. On March 20, 1887 William Floyd Luckie married Anita Inez Parks in Dodge County, GA. She was born in 1863 in Georgia. Anita Inez Parks, first wife of William Floyd Luckie. 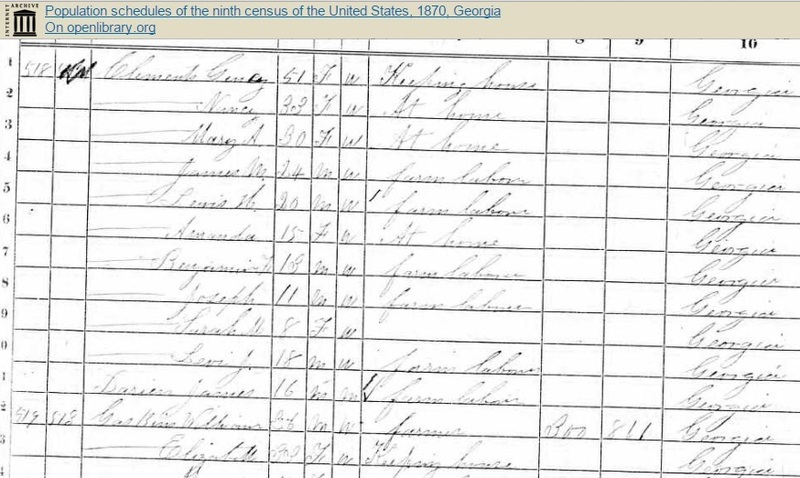 By the census of 1900 the couple had seven children and made their home in Hortense, GA in Wayne County, GA (now Brantley Co.) William was working as a merchant. Hortense is situated on the Atlantic Coast Line Railroad, which ran the fast mail train through the town, from New York to Jacksonville. But the town generated such little traffic that it wasn’t even a flag stop for the railroad. It appears that the Luckies moved about 85 miles from Hortense to McRae, GA sometime before 1903. Anita Inez Parks died May 5, 1906 and was buried there at Oak Grove Cemetery. 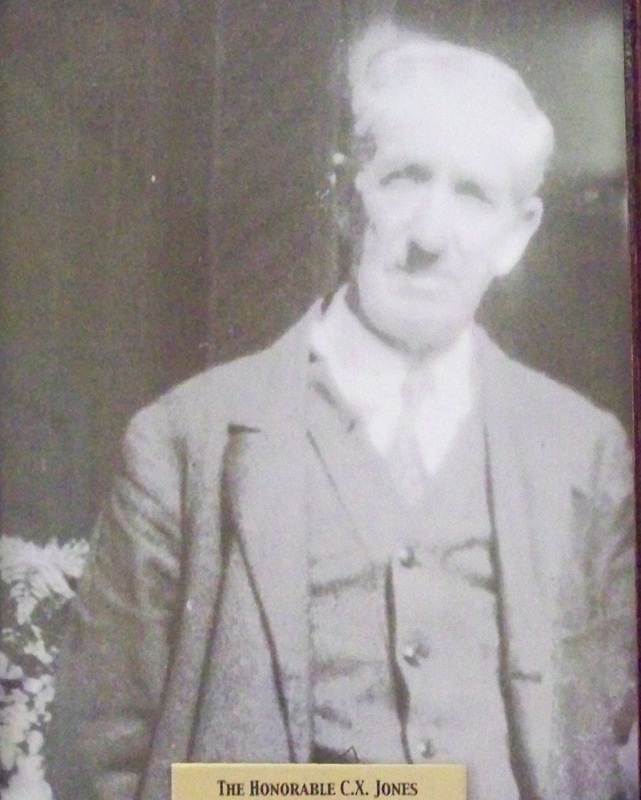 William was left a widower with eight minor children to raise. About 1907 William F. Luckie married a second time. In 1908 a son was born to this union, James Luckie (1908-1974). 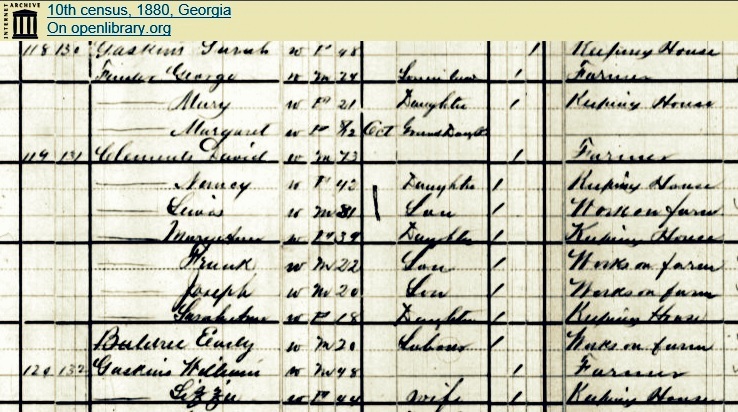 Elizabeth Susan and William Floyd Luckie were enumerated in McRae, GA with their children in 1910. William was working as a sawmill superintendent; Elizabeth was keeping house. In McRae, the Luckies owned a home on Huckabee Street, named in honor of William Allen Huckabee. Huckabee was first president of South Georgia College, a school which had been founded at McRae about 1885. 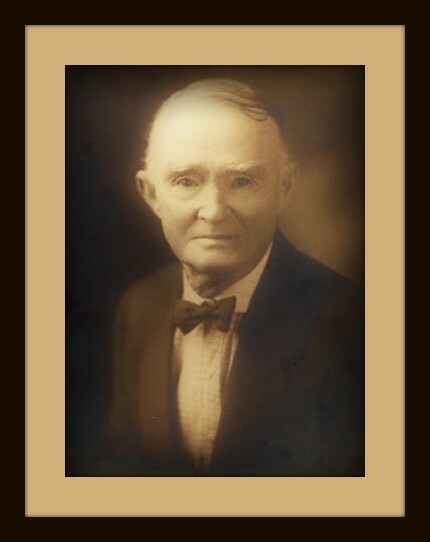 Shortly after the 1910 census William F. Luckie came to the newly incorporated town of Ray City, GA. Mr. Luckie founded the Luckie Lumber Company, a business that within a decade would grow to be one of the largest employers in the area. The big sawmill was located on the tracks of the Georgia and Florida about a mile north of town. Mr. and Mrs. W. F. Luckie were among the first members of the Ray City Methodist Church, along with Will Terry, Mr. and Mrs. Andrew Turner, Mrs. Julia Dudley, Annie Lee Dudley, and Marie Dudley. The Church was organized by brother F.D. Ratcliff on October 29, 1910. The Rev. W.E. Hightower of Remerton, Georgia served as the first pastor. Originally the services were held in a tent on the north side of town near the homestead of Mr. and Mrs. Will Clements. Mrs. B.W. Boyd and Mrs. W.F. Luckie, of Ray’s Mill came down yesterday and spent the day in this city on a shopping trip. Mr. W. F. Luckie made a business trip to McRae last Saturday returning Monday. 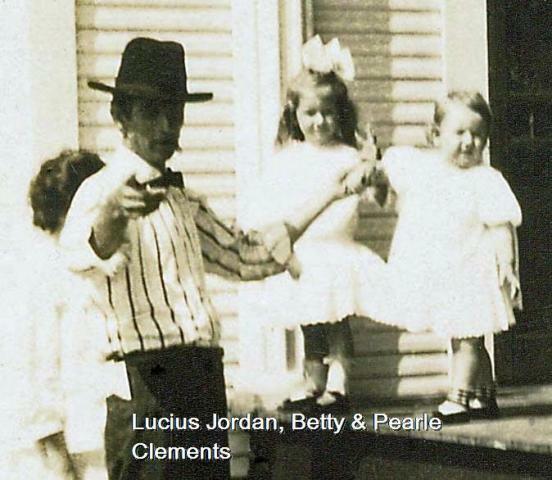 In time, the Luckie children were on the social scene in Berrien county. The Atlanta Constitution noted Willis Heard Luckie among the Ray City young people at the Nashville, GA carnival in 1914. Some time between 1914 and 1920, William F. Luckie had moved his family to Spence, GA in Grady County where he was operating a sawmill at the time of the 1920 census. But by 1921, the Luckies moved to Cairo, GA.
By the time of the 1930 census, William and Elizabeth Luckie had returned to Ray City. They lived in town in a rented house; William Luckie engaged in truck farming. William Floyd Luckie died on 16 Aug 1937 in Quitman, Brooks, Georgia. He was buried in Oak Hill Cemetery, Quitman, Georgia. William Floid Luckie (1858-1937), Oak Hill Cemetery, Quitman, GA.
After his death, Elizabeth S. Luckie went to live in the home of her daughter Nebbie and son-in-law William H. Terry, on South Broad Street in Quitman, GA. She died on May 1, 1953 and is buried at Oak Hill Cemetery, Quitman, GA.
Elizabeth Susan Luckie, (1876-1953), Oak Hill Cemetery, Quitman, GA.